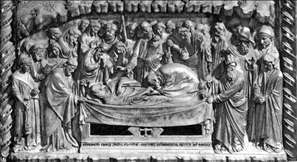 Orcagna (real name Andrea di Cione), the leading Florentine artist of the third quarter of the 14th century, a painter, sculptor, architect, and administrator. His nickname Orcagna was apparently local slang for Archangel (Arcangelo). In 1343-44 he was admitted to the guild of the painters and nine years later to that of the masons. 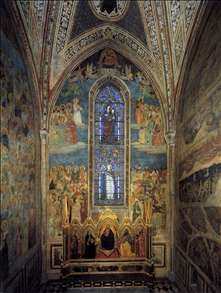 His only certain work as a painter is the altarpiece of The Redeemer with the Madonna and Saints (1354-57) in the Strozzi Chapel of Sta Maria Novella. 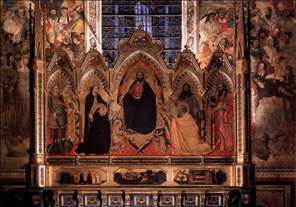 This is the most powerful Florentine painting of its period, and in spite of the massiveness of the figures it represents a reversion from Giotto s naturalism to the hieratic ideals of Byzantine art. 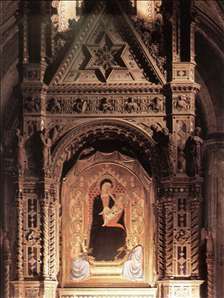 Colours are resplendent, with lavish use of gold, and the figures are remote and immobile. The major work attributed to Orcagna is a fragmentary fresco trilogy of the Triumph of Death, Last Judgement, and Hell in Sta Croce. 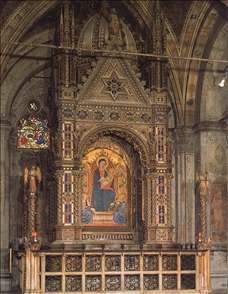 As a sculptor and architect he is known through one work, the tabernacle in Or San Michele (finished 1359), a highly elaborate ornamental structure housing a painting of the Virgin Enthroned by Bernardo Daddi. 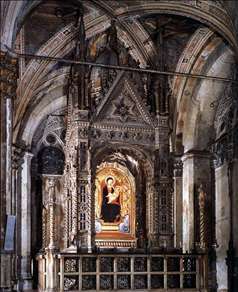 Orcagna was capomaestro of Orvieto Cathedral from 1358 to 1362, supervising the mosaic decoration of the faade. 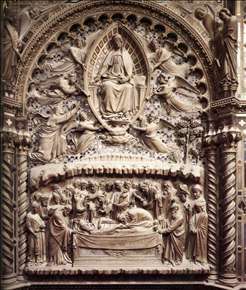 He was also an adviser on the construction of Florence Cathedral. 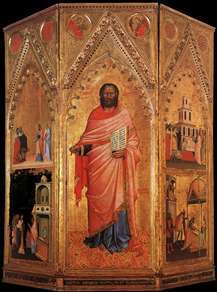 During 1368 Orcagna fell mortally ill while painting the St Matthew altarpiece (Uffizi, Florence) and this work was finished by his brother Jacopo di Cione (active 1365-98), who worked in his style and continued it to the end of the century. 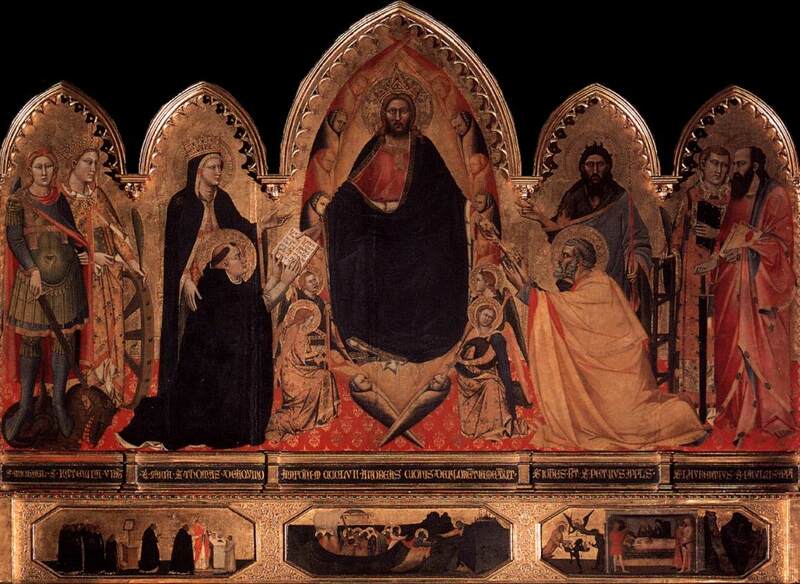 Another brother, Nardo di Cione (active 1343/6-65/6), was also a painter. Ghiberti attributes to him the series of frescos of The Last Judgement, Hell, and Paradise in the Strozzi Chapel, Sta Maria Novella, which houses Andrea s great altarpiece. 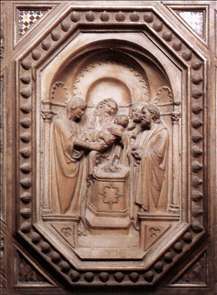 Orcagna s style was the dominant influence in late 14th century Florentine painting. See more details about "Tabernacle"
See more details about "Saint Matthew and scenes from his Life"
See more details about "View of the Chapel"
See more details about "The Strozzi Altarpiece"
See more details about "Dormition and Assumption of the Virgin, detail of the Tabernacle"
See more details about "The Burial of the Virgin"